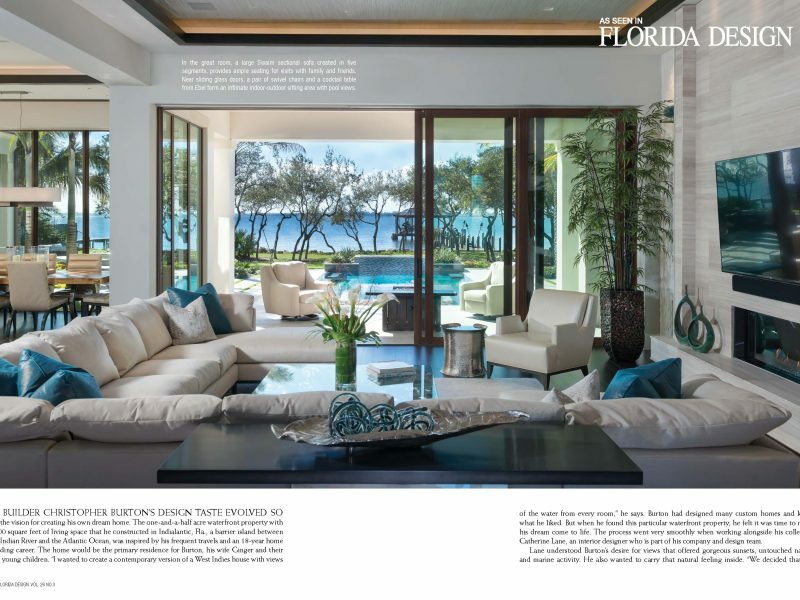 Read the full article below or in the latest Fall issue of Florida Design magazine. View more images of this custom home Gallery. AS BUILDER CHRISTOPHER BURTON’S DESIGN TASTE EVOLVED SO did the vision for creating his own dream home. The one-and-a-half acre waterfront property with 6,000 square feet of living space that he constructed in Indialantic, Fla., a barrier island between the Indian River and the Atlantic Ocean, was inspired by his frequent travels and an 18-year home building career. The home would be the primary residence for Burton, his wife Ginger and their two young children. “I wanted to create a contemporary version of a West Indies house with views of the water for every room,” he says. Burton had designed many custom homes and new what he liked. But when he found this particular waterfront property, he felt it was time to make his dream come to life. The process went very smoothly when working alongside his colleague Catherine Lane, an interior designer who is part of his company and design team. Lane understood Burton’s desire for views that offered gorgeous sunsets, untouched nature and marine activity. He also wanted to carry that natural feeling inside. “We decided that the interiors would be modern, clean and coastal—with lots of texture through tile, wallcovering, and flooring of walnut wood and Italian porcelain,” the designer says. The stunning contemporary home took two years to design and another two to build. One of the main challenges that the team faced was designing nearly every room to face the water. Once that was accomplished, they traveled around the country to marketplaces in Miami, North Carolina and other places to find the best materials to design the spaces. Outdoors, a spacious living area in the back is created with an expansive elevated porch that features two dining and lounge areas. On view from the porch is a custom infinity edge pool and spa that is perfect for relaxing days in the Florida sun. The family gathers often in the great room, a comfortable hub that overlooks the pool through tall glass windows and doors. A sprawling Swaim sectional sofa clad in a woven cream, forms an arc in front of a fireplace with a wall of sleek gray limestone designed by Catherine Lane. Finding the right size table and chairs to fit into the dining area presented another challenge. Because Burton loves wood and texture, it took more time to find the perfect size wood for the table. They finally decided on a natural wood table from Phillips Collection and edged it was custom leather chairs with horizontal channeling and padding for comfort. “We wanted a modern feel with a clean, sleek look,” Lane says. The loggia, a grand waterfront vista, offers multiple spaces for indoor-outdoor entertaining. A West Indies-inspired dining area is shaped with a polished concrete table lined with chairs in a woven resin and positioned in front a textured stone fireplace. A slate-gray poker table, encircled with chairs in cut velvet, is ideal for family game night. The completed project exceeded all expectations. “Chris is visionary,” Lane says. “He steps outside of the box and takes risks.” After two weeks of living in the home, Burton was certain he had found the perfect property. “It is better than I ever thought it could be,” he says.